But the NFC standard also allows payments to be made directly between smartphones. Apple and its competitors, such as Google Wallet, don't offer support for that part of the standard, but the technology already exists inside many of today's NFC-equipped phones and could one day allow retailers to accept NFC payment using smartphones. It would also be technically possible for individuals to exchange money with their friends through the same system. It's this third mode, if enabled by Apple or Google, that would allow a smartphone to accept payments. Smartphone payment systems are already common in some countries. Perhaps the most famous and recognizable is the Square system, which uses a small magnetic stripe reader that plugs into a phone's headphone jack. In Europe, some companies offer card readers for more secure chip-based payment cards, but nothing exists yet for NFC. "We've been working on it at Mastercard for a little while," said James Anderson, the company's senior vice president of emerging payments. "We're interested in turning every phone into a payment acceptance device." 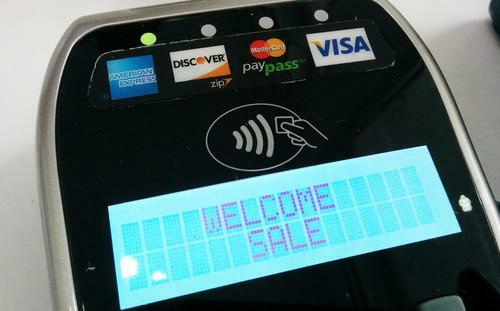 "There may be situations in which the two devices may technically be capable of exchanging data for payment, but may not be able to achieve the read ranges and/or response times required for them to be certified as contactless payment capable," said Sam Shrauger, senior vice president of digital solutions at Visa.